How to Configure PO Release Strategy? The aim of the SAP purchase order release procedure is to replace the manual written authorization procedures. An electronic signatures is used instead, maintaining the dual control principle. The person responsible for the processes of the requisition or other purchasing document in the system have to approve by marking an "electronic signature" which can give the document legal force for further processing. The release code is a two character ID allowing a person to release (clear, or approve) a requisition or an external purchasing document. The release codes is basically controlled via a system of authorizations (authorization object M_EINK_FRG). Use SE12, structure CEKKO to check all the fields available for controlling the Purchase Order. If the total value for the Purchase Order exceeds 10,000, release strategy 01 is assigned to the Purchase Order. There is only one characteristic created in this example. For controlling the Purchase Order type, create characteristic for CEKKO-BSTYP and the value NB. Format data taken from Data Dictionary (press enter) for currency dependent field, you are prompt to enter the currency which the system then converts the currency of the Purchasing document into this currency. Finally, check your PO Release Strategy configuration to make sure that there are no errors. Once the Purchase Order is not release, buyers will not be able to print the Purchase Order. Goods Receipts will be shown with Message no. ME 390 - Purchasing document XXXXXXX not yet released. 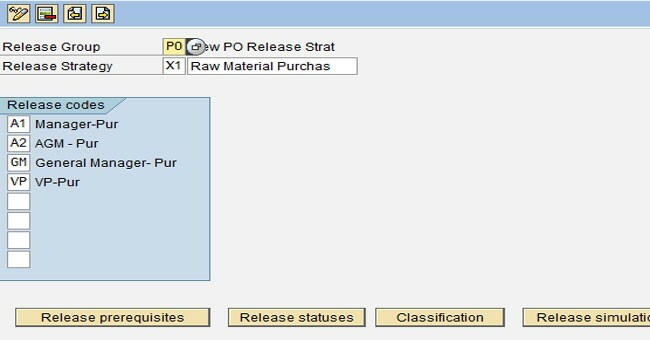 In 4.6c, Purchase Order with Release Strategy have a tabs at the end of the Header. This allowed the buyers to check the release status of the Purchase Order. The person with the release authorization have to use ME28 to release the Purchase Order. I already finished configing the release strategy procedure and checked it successfully. But I don't know why when I created the new PO meeting these characteristics, I also could receipt goods no need to release. Maybe my release strategy didn't affect on my PO. Are there anymore steps to make it active. Please show me step by step. Can you tell me the exact Message and message No. i have configured the releas strategy, however the PO does not pick up the strategy on a particular purchasing group, but when i change the purchasing group the release is effected? Any way to have more than 8 release codes in a strategy? quotations received from different vendors and the comparative statement is prepared and the vendor is finalised for the particular work. I need release strategy on the basis of the value, with out raising the PR and I wish to know whether it is possible in SAP.any one can answer for my quories. I have a new buyer, she should be able to release purchase orders up to certain amount, But her all orders are stuck and need to released, How can i correct that so her orders are not stuck.